"This image of a coronal hole on the sun bears a remarkable resemblance to the 'Sesame Street' character Big Bird. Coronal holes are regions where the sun's corona is dark. These features were discovered when X-ray telescopes were first flown above the Earth's atmosphere to reveal the structure of the corona across the solar disc. 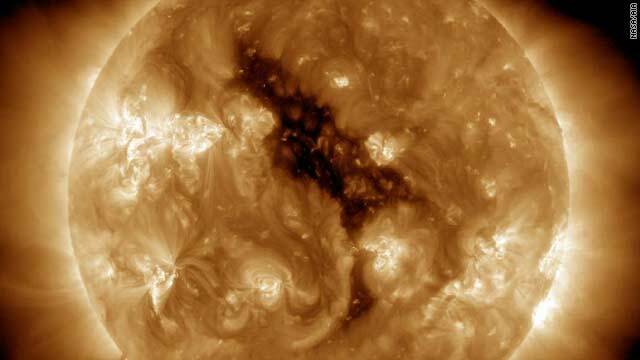 Coronal holes are associated with 'open' magnetic field lines and are often found at the sun’s poles. The high-speed solar wind is known to originate in coronal holes. The solar wind escaping from this hole will reach Earth around June 5-7, 2012." Howdy are using WordPress for your blog platform? I'm new to the blog world but I'm tyirng to get started and set up my own. Do you require any html coding expertise to make your own blog? Any help would be greatly appreciated!